Lions head coach Jim Caldwell put a guy named Jim Bob Cooter in charge of calling offensive plays. 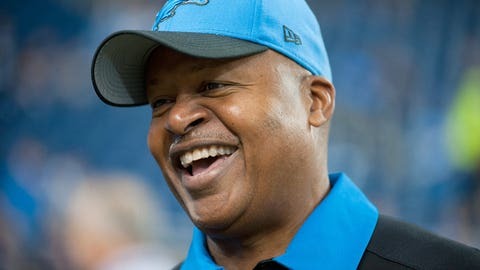 Detroit Lions head coach Jim Caldwell has transferred offensive coordinator responsibilities to a different member of his staff, after parting ways with Joe Lombardi and two of his offensive line assistants. The new man in charge of Detroit’s offensive play-calling is named Jim Bob Cooter. The media is having its fun with Cooter’s name, just as the Lions players did when they were first introduced to him. Even quarterback Matthew Stafford acknowledged the hilarious nature of the new coordinator’s name, per Dave Birkett of the Detroit Free Press. Stafford on Jim Bob Cooter's name: "I thought it was awesome. It’s quality stuff. You can’t make it up." Not only does Cooter have a goofy name working against his respectability, he’s also really young at only 31 years old. Yet Caldwell is not concerned about his new offensive coordinator’s name or age, according to the Free Press. Caldwell on Cooter being 31, younger than some players: It doesn't matter as long as he's competent .. "He's a unique guy"
Four players on the Lions’s current roster — Darryl Tapp, Matt Prater, Haloti Ngata and James Ihedigbo — are the same age as Cooter. Five of the team’s most experienced veterans — Manny Ramirez (32), Dan Orlovsky (32), Lance Moore (32), Don Mulbach (34) and Rashean Mathis (35) — are older than him.